, a celebrated botanist of Montpellier, was born in 1638. He was bred to physic, but, being a protestant, could not take his degree there. He appears, however, afterwards to have obtained it elsewhere, | and practised physic at Montpellier for a long course of years, and at the same time very assiduously cultivated botany, with the most enlarged views to its advancement as a science. He was beloved for his urbanity, and esteemed for his knowledge. Numerous botanists flocked at this time to Montpellier, that neighbourhood being famous for its vegetable riches; and these were all eager to enjoy the society, and to benefit by the guidance and instructions of so able a man. Among the pupils of Magnol were Fagon and the illustrious Tournefort, who regularly studied under tym, and on many subsequent occasions gratefully acknowledged their obligations to him. 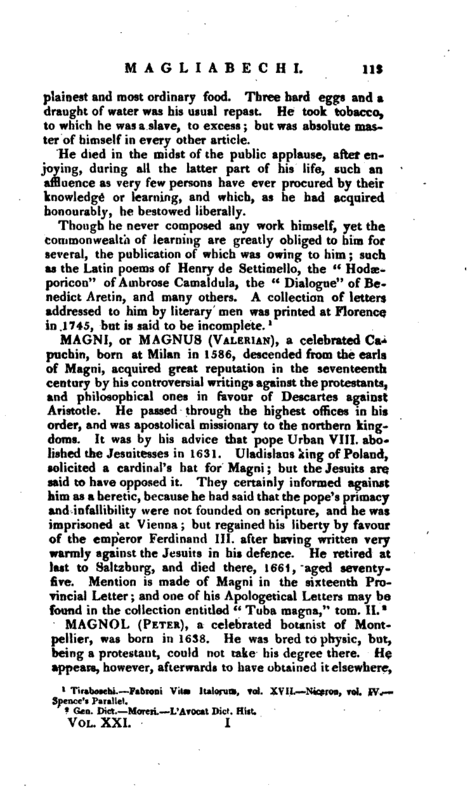 He was not chosen public professor till 1694, when he assumed the guise at least of Catholicism. 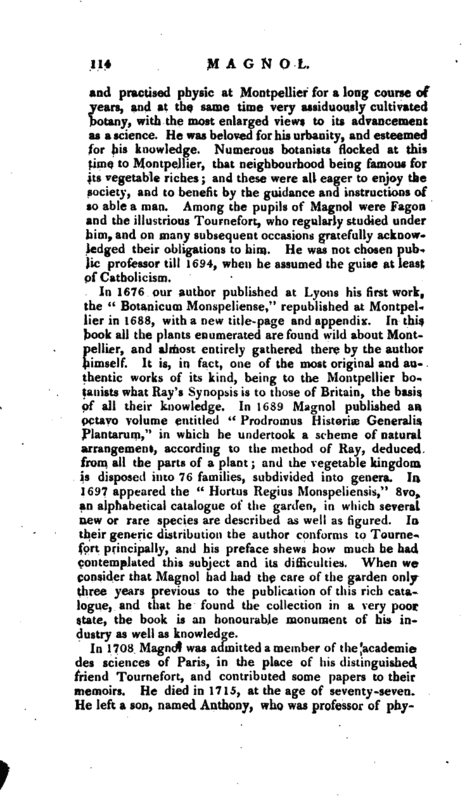 In 1676 our author published at Lyons his first work, the “Botanicum Monspeliense/‘ republished at Montpellier in 1688, with a new tide-page and appendix. In this book all the plants enumerated are found wild about Montpellier, and almost entirely gathered there by the author himself. It is, in fact, one of the most original and authentic works of its kind, being to the Montpellier botanists what Ray’s Synopsis is to those of Britain, the basis of all their knowledge. In 1689 Magnol published an octavo volume entitled” Prodromus Historic Generalis Plantarum,“in which he undertook a scheme of natural arrangement, according to the method of Ray, deduced from all the parts of a plant; and the vegetable kingdom, is disposed into 76 families, subdivided into genera. 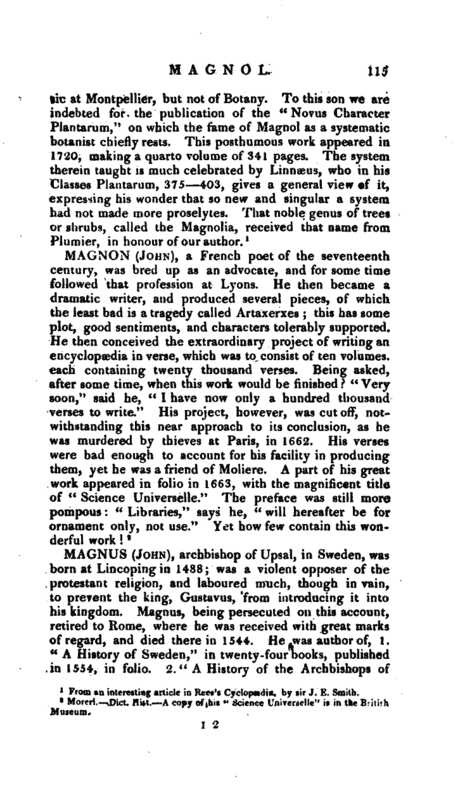 In 1697 appeared the” Hortus Regius Monspeliensis," 8vo,. an alphabetical catalogue of the garden, in which several new or rare species are described as well as figured. In their generic distribution the author conforms to Tournefort principally, and his preface shews how much he had contemplated this subject and its difficulties. When we consider that Magnol had had the care of the garden only three years previous to the publication of this rich catalogue, and that he found the collection in a very poor state, the book is an honourable monument of his industry as well as knowledge. From an interesting article in Rees’s Cyclopsedia, by sir J. E. Smith.